CELTA: Teaching Pronunciation – 9 Free Online Resources for Having Fun with It! On your CELTA, teaching pronunciation might be one of the parts you dread doing because it seems so difficult. The international phonetic alphabet (IPA) can look like another language altogether, while the thought of actually teaching pronunciation is enough to cause sleepless nights for some. To get around this, here are my favourite resources to help you on your CELTA, teaching pronunciation like a pro! 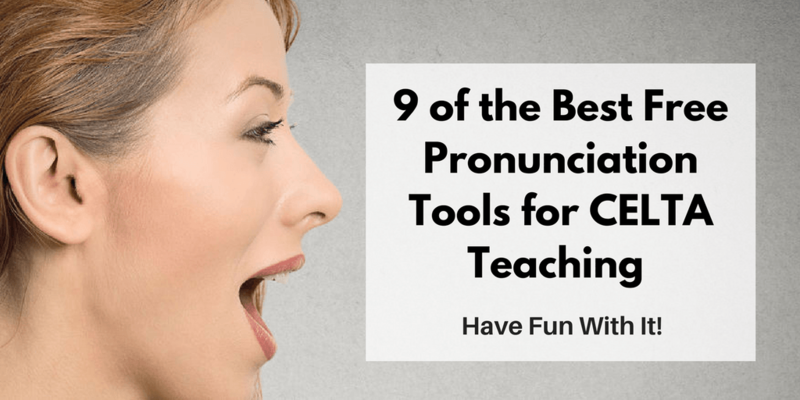 I should also say that, although not all of the resources below may not appeal to you for use in an observed teaching practice on your CELTA, they can still help you prepare for and learn about pronunciation in the ESL classroom. This is a great free tool (with pay-for options) that I have been using recently in my lessons at the university I work in. 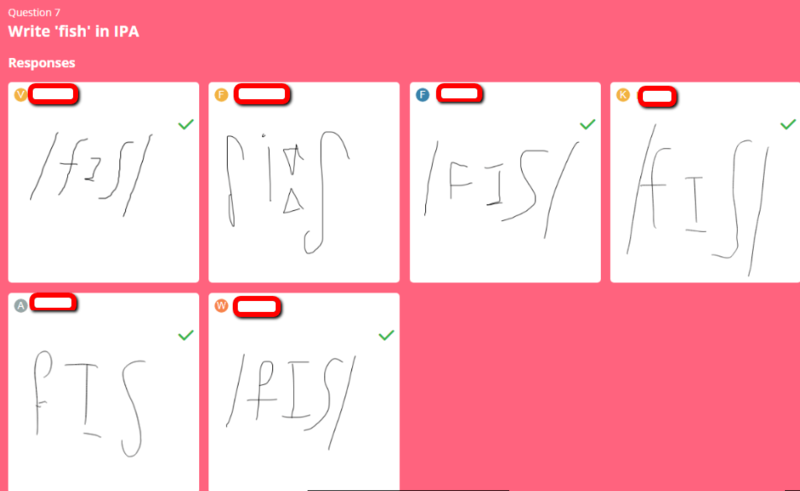 There are several features which I really like about Spiral.ac, but the main thing is that allows students to easily draw pronunciation in IPA in your ESL lessons. How come? Well, you set them a question, with a timer if you like, and they have to ‘draw’ the answer. The drawing element allows them to write IPA phonetic symbols and makes for a very fun ESL pronunciation activity. When students answer, it flashes up on the screen, if you want it to. You can make answers anonymous (which I recommend) or you can send the answer back to the student to work on it further. The only drawbacks of Spiral are that the free version is a bit unclear (you can have ‘up to 5 classes’, but each class can have an unlimited number of exercises!). The other point is that it needs a bit of practice to get used to, but it is relatively simple – try it with your own smartphone before using it in a class! You may well have heard of Quizlet for flashcard learning but it can be used to good effect for teaching pronunciation on your CELTA. You can either prepare groups of flashcards with IPA transcriptions in advance of a lesson, or have a collaborative set which students can add to as you go. You can also try the different types of Quizlet activity by clicking on ‘Choose a study mode’ in the bottom right-hand corner (there are some, games too!). Each time you refresh, it creates a new order based on your own learning – pretty clever stuff in a simple package! The only caution I would give for using Quizlet to teach pronunciation in an EFL lesson is that many of the sets already created by others might be incorrect. Hence, you would need to check them carefully before using, although I would recommend making your own. The other point to note is that learning in lists can cause confusion and is not highly recommended so only make sets with no more than perhaps 10 words, if that. This app is recommended for learning IPA as a teacher, or for suggesting to students as homework. It has a free version which is sufficient, complete with games and the entire IPA. The paid version is around US $5 so it is not too expensive but obviously it is not absolutely necessary. The app also has production and recognition pronunciation activities to further develop knowledge of the IPA. It is also available on both the App Store and Google Play, so is compatible with all the main types of devices. In terms of your CELTA, teaching pronunciation itself with this app might not be that easy but it’s a nice way to learn and suggest practice for homework. 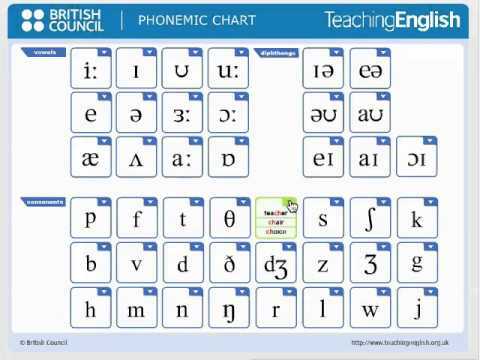 OK, so this one is strictly for teachers, but it shows the pronunciation exercises that I use most often in my ESL lessons. They are simple and fun – and most importantly, can be used on a CELTA for teaching pronunciation quite easily! It is great for making ‘pronunciation as a physical activity’, as Adrian Underhill says himself. The full lecture is included below, but be warned – it is just over 1 hour long! That said, I have watched the first 20 minutes several times and it is fantastic for all kinds of pronunciation drills and exercises. It is also recommended as a great first guide for how to teach pronunciation for beginners. I have to say it is the most fun method of teaching pronunciation I have come across! This has been a fantastic pronunciation tool which I have used over many years from a respected ESL institution, the British Council. However, recently it has changed to a (free) download only file, as opposed to appearing direct on their website. Nonetheless, it is great for examples with audio, and has 2-3 examples for each sound available. It is also very easy to use and interactive, so can be used for another pronunciation activity. You can get this as an official download via the British Council’s website here (see ‘Downloads’ section). 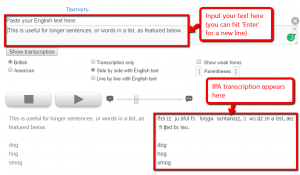 If you head over to lingorado.com/ipa, you can input large amounts of words or text for an instant transcription. It is great for quickly transcribing sentences, especially for things like your language analysis sheets when planning CELTA lessons. As always, there is a catch – it is not always perfect with ‘e’ sounds – so use with caution! For example, see the transcription for the word ‘sentence’ above compared to how it displays on the Cambridge dictionary. Either way, it can help you speed up your transcriptions and is an easy way to ‘type’ in IPA on your computer. The reason I recommend this is because it has both British and American pronunciation with audio for each. It works very well on smartphones and is there easily accessible for students without downloading anything. 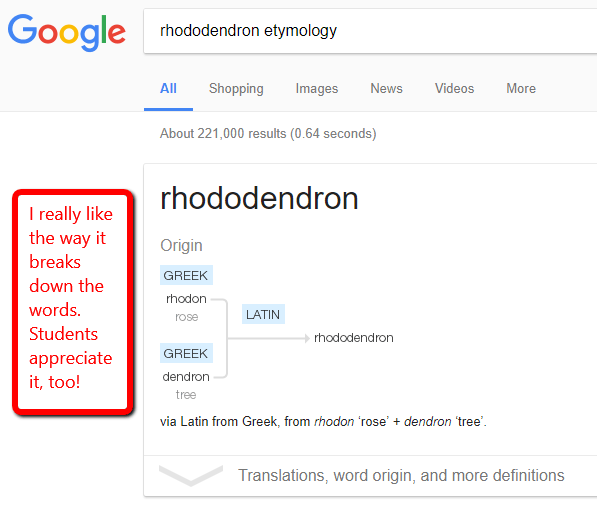 This overlooked feature in Google searches is a fun and fast way for students to practise their pronunciation on their smartphones. OK, so it’s not perfect – it can’t always understand me saying some words – but if you choose words carefully, you can challenge them to say them out loud and see who can get it to work. 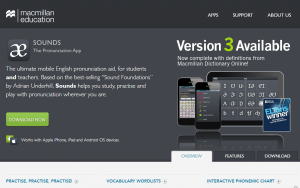 If not available on students’ phones, other alternatives include the voice recognition on dictation.io (although I have had some issues with this), which uses Google’s software to detect speech. You can also use the speech recognition feature in Google Translate and ignore the translation as another alternative. I have not used this extensively in a lesson but it is something I plan to develop activities around in future. 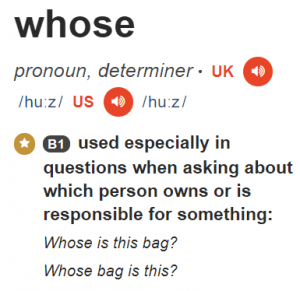 Added to the pronunciation element, I feel that understanding the different parts of a word helps to understand the word in full. Although not shown above, it also often shows the IPA transcription of the word next to the origin, displaying a lot of information in a clear and concise way for students. In summary, just remember that to pass your CELTA, teaching pronunciation is not always the most important skill but it certainly is helpful to understand it! Well, that’s the end of my list – have I missed something? If you have a great tool, leave a comment below and tell me all about it! There are so many ways to do this I am sure there are many I have not thought of or heard of yet – so tell me more!